This is my son’s 3rd Xmas and he is most excited as he has started identifying & understanding the ‘hullabaloo’ attached to Xmas. He even helped in decorating his very own Xmas tree & Santa Claus. Though Santa came in a bit early & he got his gifts earlier than 25th. In all this Xmas spirit in my house how can I not bake Xmas Fruit Cake. Though honestly speaking, I almost didn’t make it. I was scouring for a good fruit cake, I realised that most eggless versions use boiled fruit recipe, which I am not very keen on. 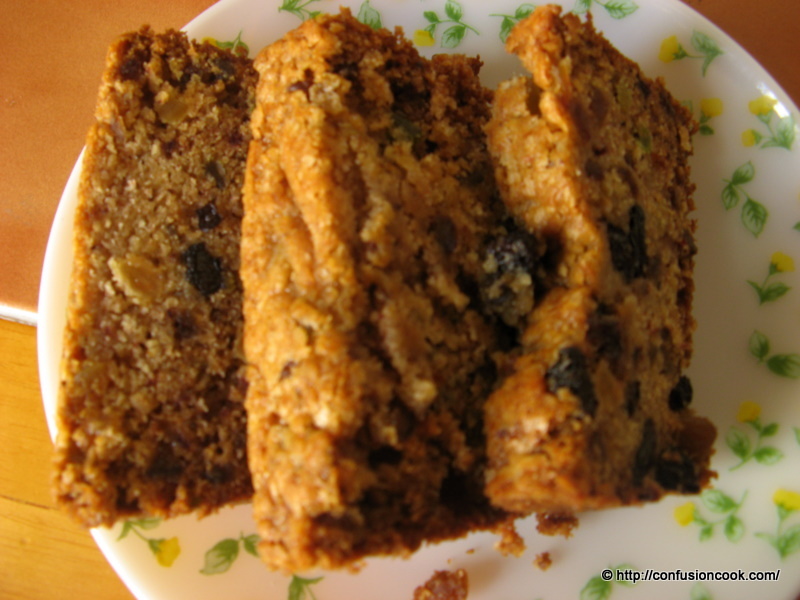 Finally my search took me to Joy of Baking & I came across an eggless version of fruit cake. I made slight changes to suit our tastes as well as with what is available. I reduced all the spices by 1/2 as V wasn’t keen on a very strong & tangy flavor. Also, I ran out of Vanilla essence so used Almond as it was available. I also used curd in place of buttermilk & replaced currants with tutti-fruiti. And not to forget I cajoled V into helping me out in this one as I was being too lazy. :) He happily obliged & we managed to put it in oven finally with lots of bickering. That’s what couples are for, I guess! Pre-heat oven at 165 C. Grease & dust a loaf pan. On a chopping board, spread 1/2 cup flour. Coat the dates in the flour & chop them coarsely on the board. The flour prevents the dates from breaking down & becoming soft & mushy. In a large bowl, place the remaining flour & dates mixture. Add spices, sugar, salt & baking soda. Stir to combine. In a separate bowl, whisk together buttermilk, melted butter & vanilla extract. Stir in buttermilk mixture & remaining dry-fruits into the dry ingredients. Mix well. Immediately pour into the prepared pan. Smooth the top & bake for 50-55 mins or till the cake is golden brown & pulling away from sides. Remove from oven & allow to cool in the pan for 10 mins on a wire rack. Remove from pan & allow to cool to room temp. As advised by Joy of Baking, this cake tastes excellent when warm or at room temp. We felt that sugar was a wee bit too much for our taste. So next time I will surely reduce it to 1/3 rd cup. The cake was soft, moist, spicy & perfect for Xmas. Sending this to Jingle All The Way Event, hosted by Kavitha Iyengar of Edible Entertainment.